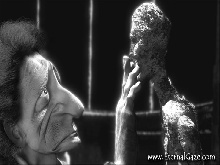 ETERNAL GAZE implies a landmark in the history of independent digital animation. Almost everything is unusual in this production; from its format –sixteen minutes of images without dialogues, where the music carries the story- to the black and white images and the classic selection of camera movements, which are completely removed from the common visual balancing act of this genre. However, what is most outstanding is undoubtedly the bold choice of a theme which could seem to be totally inappropriate for a 3D animation piece. Eternal Gaze is the story of the last nine years of the tortured Italian sculptor Alberto Giacometti. The film is as much an ode to a man and his art as a recognition of his legacy, which for the film’s creator is one of the greatest but least recognized of twentieth-century art history. This piece emerges from the endless fascination of the Californian animator Sam Chen with the Giacometti's work. In 1999 Chen studied at Stanford University and as a homework he had to read “Giacometti Portrait”, the story of a model who had posed for the artist for eighteen days. Dazzled by the story, Chen began to research every detail of the sculptor’s life and at the same time he took photographs of his works exhibited at the New York MoMA. After six months writing the script, Chen began a creative process which has almost lasted three years, with the only help of his collaborator, the composer Jamey Scott. Aware that the story’s tone should be more similar to a documentary than a cartoon, Chen gave special attention to be historically faithful not only to the story’s details but also to the recreation of scenarios and objects. The artist’s studio where the action takes place is a replica of the original designed from photographs. 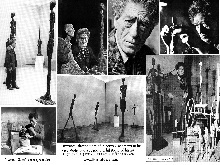 For the animator it was particularly important that the fifteen sculptures by Giacometti which appear in the short film were exact copies of the original, specially faithful to the rough appearance of their metal texture. He used three different models for Giacometti’s character in order to show the nine years which passed between the beginning and the end of the story. 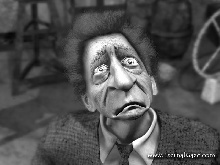 100-percent of the animation was hand-keyframed, not using thus motion-capture technology. 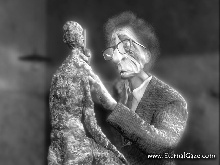 Eternal Gaze won the Best Animated Short for the SIGGRAPH 2003.